As the deadline for the fall soccer transfer window looms at the end of the week, the much-maligned Arsenal man Park Chu-Young may have a few rays of hope to break through the purgatory he’s known at the Emirates. The man that few Gooners recognize or really knows represents one of strangest mysteries of the EPL campaign last year: while PCY might not have been a household name in England, why was the captain of the South Korean national team, a dangerous striker who had been a proven goal scorer for past clubs and country, completely thrown under the bus by Wenger with his sentence nearly being complete football purgatory? Only 4 months ago, he disappeared from existence from Arsenal’s standpoint. In May after he quietly flew back to Korea, Park Chu-Young disappeared – literally. No one could reach him or find out about his condition. The script wasn’t supposed to play out this way. Rewind exactly one year ago, we find the 26 year old transferring from relegated AS Monaco to the previous year’s Ligue 1 champion, Lille. Knocking on the door to his hotel room so he could complete his medical at the club, Lille officials found it completely abandoned, Chu-Young nowhere in sight. Several hundred miles away, cameras were flashing in North London –and Park Chu-Young became the newest Arsenal member, the #9 jersey given to him in a £3-5 Million secretive move just as the August 31 transfer window was closing. His dream to achieve European soccer glory was about to begin…(cue the script editors). Wenger at the time hailed the move to the BBC, “He will add true quality to our attacking forces and will be a valuable addition to the squad.” As he did get placed in a few Carling Cup matches to let Wenger experiment with his new acquisitions (including scoring a delicious goal against Bolton (http://www.youtube.com/watch?v=HvmfBnwoPHE), his opportunities early on were extremely limited. Several factors started to weigh against Park getting some adequate playing time. Robin Van Persie was just beginning to tally goals in what would eventually become an epic year for him. The 2011-2012 Arsenal campaign started off with failure in spectacular fashion. Witness the disaster that struck early in the season with an 8-2 thrashing at the hands of Manchester United. Suddenly the Gunners were in the unfamiliar role of being in the relegation zone with a lumbering 17th position in the tables. Remarkably, Arsenal clawed their way out to end the season in 3rd place. Starting out in that kind of hole meant that Arsenal would be playing catch up for the entire rest of the season. Wenger didn’t care for adventure like that, and largely stuck to a conventional lineup of previously established players. Experimental lineups only existed in Carling Cup match ups. It also meant Arsene had to pray to every deity known to man that RVP wouldn’t get hurt as he had in years past. Rest Van Persie so he could last the season? NFW. Not when he was on the torrid pace of breaking EPL scoring records. All these factors conspired against Park Chu-Young. Wenger kept promising that Park would start his first regular EPL match after his versatile performance against Bolton in Carling Cup action (http://www.bbc.co.uk/sport/0/football/15455547), and then…nothing. I’m looking at a composite video from his Carling Cup match with Bolton last October. Meanwhile, an announcement came on December 20th regarding his Korean national teammate Ki Sung-Yeung. Ki just won the South Korean Player of the Year award, given by the Korean FA largely on his club performance for Celtic. In late December, Arsene spoke to the Daily Mail (http://www.dailymail.co.uk/sport/football/article-2078931/Arsene-Wenger-Be-patient-Park-Ju-young.html) urging patience from some fans inquiring when the team would finally capitalize on the skills of the South Korean captain. Park came on the pitch for the first time for Arsenal in a regular EPL game, only in the 82nd minute of a 2-1 defeat of Manchester United. That was January 22. With PCY wasting on the bench, the January transfer window seemed like a good time to fly from the Emirates. Interest from Fulham looked promising, and Sunderland’s Martin O’Neil asked about loaning him out for the rest of the season. Arsenal rejected the requests quietly. But in rejecting the loan & transfer bids, if the calculus on Wenger’s part in late January was to inject Park into the team’s equation later in the year, why then did it result in more of the same? Thierry Henry rejoined his old team via a brief January loan from the NY Red Bulls. Sentimental for Arsenal fans, the brief affair closed in February and Park continued wonder about his place with Arsenal. In March, a furor erupted in Korea over the disclosure of a 10-year residency arrangement made while in Monaco, allowing Park to forgo temporarily his mandatory military service for the South Korean Army. It’s mandatory for South Korean males to serve a 2-year stint before the age of 29, a consequence of 60 years of being in technical state of war with North Korea. This burden hangs over every Korean player trying to break into European football (with some clubs tending to overlook Koreans due to the situation). Park received the temporary deferment to serve in the military from his time at AS Monaco; complicating matters, the letter was issued days before his signing with Arsenal, only to be revealed as further negations with the club were underway in early March (Arsenal got tagged with an additional £1.2 million on his contract). Park subsequently was attacked by conservative quarters in Korea for being a ‘draft dodger.’ He tried to reassure his critics that he would serve after he’s done with playing in Europe while still in his prime. Nevertheless, the unnecessary controversy dogged Park for months, affecting his standing with the Korean FA. March turned into April, and while the club nestled near the 3rd and 4th place in the table, Park disappeared further–even from the 18-man lineup. Distant news occasionally surfaced with Park coming on and scoring in reserve matches. As the season was wrapping up in May, Ben Somerford wrote for goal.com arguing that PCY faced a critical crossroads in his career. The prognosis: staying at Arsenal could fundamentally damage his professional career. I want to step away from this and just imagine. What was it like to be in his shoes at that moment? The pressure from all sides. The frustration. Of missed opportunities in spite of high expectations. He emerged a few weeks later, thankfully safe and sound, recalcitrant to his home country, and declared himself ready to play football. Despite missing the friendly with Spain and a few World Cup qualifiers in June, once he got the public apology for the misunderstanding surrounding his military deferment out of the way, he immediately began work with his old coach from his days on the South Korean U-20 team, Hong Myung-Bo. Hong, who achieved his own World Cup glory as part of the storied 2002 South Korean national team, now helmed the Olympic men’s team, a U-23 team including 3 designated over-age players. Hong had faith in Park to lead the way in scoring goals and get a shot at what had been up to that point unreachable for South Korea: a medal in Olympic soccer. If there was one thing that finally went Chu-Young’s way, the timing of the 2012 Olympics couldn’t have been more perfect. After his abysmal year and shoddy treatment in North London, the stage was now set, in front of the whole world watching – to show up at the 2012 Olympics, right back in the heart of bloody England. Many analysts had written off the Korean side as fast but not capable of advancing too far beyond the group stage. Only those who followed the team’s preliminary finals had a fair idea of just how far they could go. Following the saga of Park, Korean fans had questions of their own: can he shake off the memory of his time with Arsenal, regain his confidence and find his mojo again? After a goalless draw with Korea dominating most of the opening match against Mexico, the priority was finding the net in the second group match vs. Switzerland. Game was scoreless going into the half. Despite Korea’s dominance in possession, the score provided anybody the game the taking. Second half, the South Koreans kept probing the Swiss defense when Nam Tae-Hee delivered a cross into open space near the penalty area. 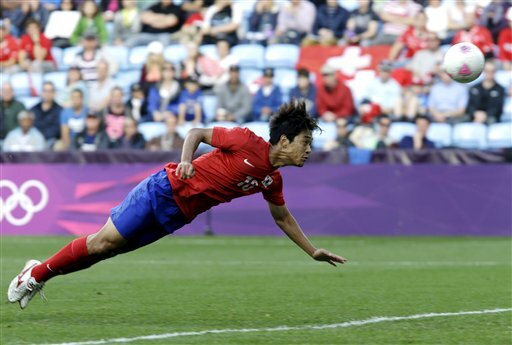 That day in July, Park Chu-Young flew -arms like wings over the ground, connecting the cross with his head, and with the momentum of flight blasted the ball past the Swiss keeper. He scored the first goal in Olympic action for the Korean side. Park Chu-Young knelt down to thank his maker, then was mobbed by his grateful teammates. Winning the match 2-1, South Korea eventually advanced from the group and faced hosts Great Brittain at the cavernous stadium in Cardiff. Park nearly scored twice from the onset and the Koreans overwhelmed the hosts throughout most of the match. Underestimated and overlooked before the tournament, Korea brought down the hosts in a dramatic overtime penalty shoot out, featuring the minutes old debut of goalkeeper Lee Bum-Young –coming out for the injured Jung Sung-Ryong. Lee breathtakingly blocked Daniel Sturridge’s PK, and Ki Sung-Yueng put it away with the final winning penalty kick. The celebrations began in England and halfway across the world: Korea was two games away from possibly winning the gold medal. Brazil, however, stood in the way, and in the semifinal match took control of the second half to put away the game 3-0. Of course, that score doesn’t tell the full story, with replays clearly showing penalties that should have been awarded to Ji Dong-Won and later Kim Bo-Kyung. The refs didn’t see what everyone else saw, and lady luck wasn’t with the Taeguk Warriors that day. Hypothetically Korea would have had 2 goals to 2 fantastic goals that Brazil definitely earned. Brazil’s first goal was a weak shot that should have been blocked by keeper Lee; with Jung still injured from a knock with Micah Richards, Lee badly mishandled the ball. If that 2-2 score had held, oh what could have been, especially considering Mexico defeated Brazil in the Gold medal match –the same Mexican team that Korea nearly beat the week before. Last chance at medal, 3rd place was on the line with a tantalizing match up with archrivals Japan. Hong Myong-Bo constructed a strong forward line up for the haniljeon against Japan to accomplish a feat South Korea has never accomplished, a medal in Olympic soccer (Japan had already won the bronze in the sport in 1964). The game had more on the line than national pride and an age-old grudge match between regional rivals. For the South Koreans, they had a once in a lifetime chance to get out from under the onerous burden of compulsory military service: an Olympic medal is a ticket to exemption from the military. They would be free – free to pursue their soccer ambitions in Europe or anywhere else in the world without restrictions. Nerve wracking, Korea’s early momentum was ebbing away with 3 yellow cards in quick succession. Despite some waves of Japanese attacks, the game was scoreless until Park received a high pass midfield that was nearly headed away by a Japanese defender. Suddenly he broke free, running straight towards the goal. The Japanese defenders scrambled to catch up with him, but with a brilliant series of moves, deked out not 1, but 4 defenders and slotted home one of the most spectacular goals of his career. Boom. It was the return of Park Chu-Young, and his scoring mojo. The rest of the game was a blur, but he was all over the pitch –terrorizing the defenders and nearly scoring on a number of occasions. Park connected with Koo Ja-Cheol up front and the Wolfsburg/Augsburg international finished it with the 2nd and final goal of the match. Then it was all over. Ironically, Park got the permanent military deferment he sought out earlier with AS Monaco, the manufactured issue that should never really been an issue in the first place. Since the Olympic torch moved on from London, Kim Bo-Kyung was brought over to Cardiff in the Championship and Ki Sung-Yeung moved from Celtic to a superb Swansea side, becoming the 10th Korean to join the EPL. Koo Ja-Cheol is trying to steady the ship over at Augsburg in the Bundesliga and the other athletes on the team have since returned with honor to their respective clubs throughout Asia. Which leaves us with the fate of Park Chu-Young. After his performance in the Olympics, he’s been linked with Fulham and Celta Vigo in La Liga. Norwich’s interest has also muddied the transfer picture. Worrying has been rumors that Arsene has been trying to convince him to stay an additional 6 months with RVP and Alex Song jumping ship right before the 2012-2013 season started. Looking over at the BigSoccer online community board concentrating on Koreans plying their trade internationally (http://www.bigsoccer.com/community/forums/korean-players-abroad.1450/), it’s nail biting time amongst fans with emotions running high with credible news sprinkled in with rumors flying and speculations on possible transfers. I’ll offer this final overarching statistic: Park Chu-Young scored 53 goals in 113 international appearances for the Korean national team. By that statistic alone, it is a testament to his goal scoring craft. The case for Park Chu-Young has been made. But his story is not yet complete. Time will tell whether he will recover full confidence, get picked up by a club that recognizes and utilizes his talents, and ultimately get a piece of European football glory in the process. If he does, it will be yet another crazy twist in the remarkable saga of Park Chu-Young. I suspect there will be many more twists to be unraveled still. Update: Reports indicate Park Chu-Young packed up his bags at the Emirates earlier today (8/30/12) and flew out to Spain for a medical. Celta Vigo appears to be the target. I’ll try to get more out on this soon.